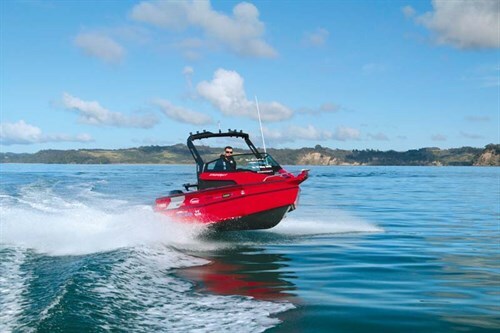 With the Stabicraft 1600 Carbon, this Kiwi aluminium boat manufacturer introduces a new level of materials technology into its already top-notch aluminium boats. 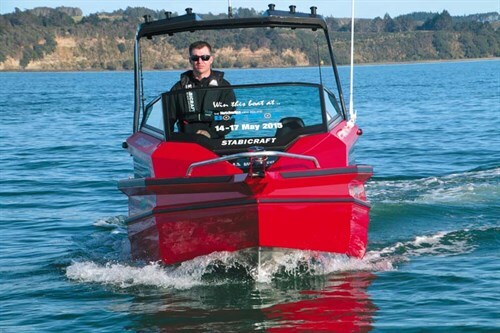 With the 1600 Carbon, Stabicraft is the first NZ trailerboat manufacturer to introduce carbon fibre technology into its above-water structure. It’s a well-executed development, adding strength and weight-saving to an already popular brand. Stabicraft has been on the forefront of innovation since rolling out its first rigid hulled aluminum pontoon boat in NZ in 1987. 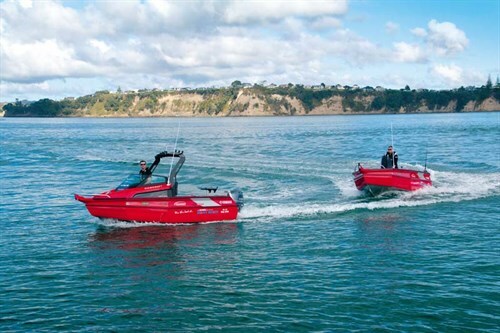 Clearly it hit the mark with the public and, since then, Stabicraft has grown to be the kiwi market leader in aluminium boats. 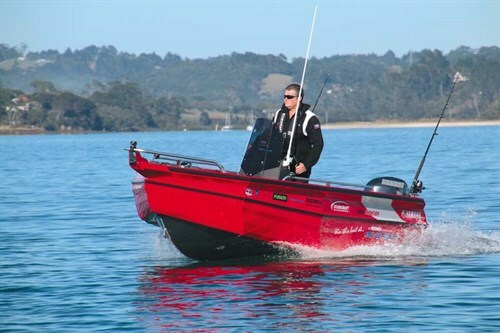 One of NZ’s leading boat exporters, it has a considerable waiting list for its most popular Stabicraft boats. This popularity has created its own challenges, with many copycat designs trying to sneak market share from it. The challenge to Stabicraft was how to improve on its designs and streamline production, without compromising on the ruggedness, stability and ride quality that has got them to number one in the market. The Stabicraft 1600 Carbon hull is completely new, the result of 18 months R&D and building on the success of the Stabicraft 1530 and 1650 fisher models. 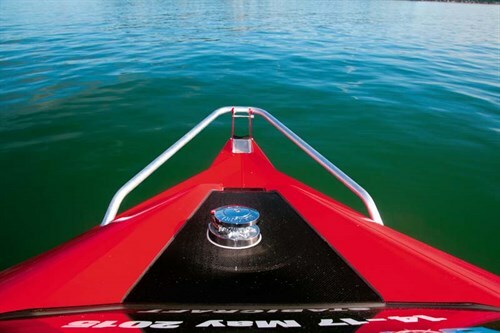 These feature the proven Arrow pontoons, which enable the weld lines to rake backwards at the shoulders of the boat, a feature that is claimed to give a softer ride. Those pontoons also feature the wing-style coamings, which provide a broader top surface while also deflecting any water or spray coming up the sides. The Game Chaser transom, popular on the bigger Stabi’s, has also been incorporated into this new hull, allowing greater manoeuvrability as well as adding strength and increasing waterline length. Up to the gunwale level the boat is traditional Stabicraft – marine grade alloy (4mm on the hull and 3mm for the pontoons) folded and welded with the company’s trademark sealed pontoons providing positive buoyancy. However the superstructure on both boats are a radical departure for Stabicraft, constructed of resin-infused composite with carbon-fibre strengthening. Although carbon fibre has long been used for racing yachts, this is the first production trailerboat made in New Zealand to use this material. The benefits of the new materials are in the strength and ability to mould compound curves, something that is hard to do with aluminium boats. Although fibreglass is often heavier than alloy, using the carbon fibre allows Stabicraft to reduce the weight while increasing the strength of the modules. It is no coincidence that this new technology also lends itself to larger production runs, allowing Stabicraft to increase their output and improving customer delivery times. The Frontier models are Stabicraft’s centre console range, and they offer some unique benefits over other designs. 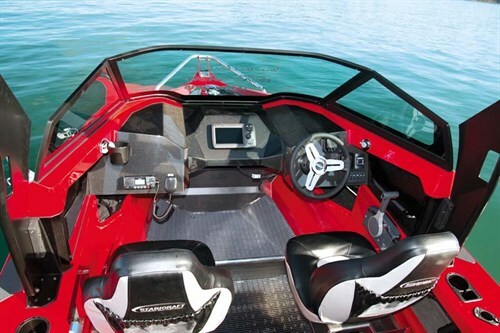 The stunning red paint job of the review boat highlights how well the arrow pontoons suit this style of boat. The broad gunwale with the wing-style coamings all around the boat, completely flat from bow to stern, offers a convenient seat no matter where you are fishing. The height is just right to offer both good thigh support and a comfortable seat, while also providing a great surface for mounting accessories. That surface features several non-slip pads plus the unique Stabicraft-designed Railblaza Multiholders. The Multiholder has room for a large drink bottle, phone holder and/or sinker storage. They also have the option of incorporating a Starport accessory mount, and are accompanied by a separate rodholder. Grabrails along the sides and in the bow have additional Railblaza Starports. The 1600 Frontier’s main feature is the beautiful centre console. Manufactured from resin infused composite with carbon fibre reinforcing, this is a wide unit with plenty of space for accessories. Both prize boats are fitted with a fantastic electronics package, comprising a Furuno GP1870F colour chartplotter and fishfinder, Uniden UM380 VHF and Fusion MS-RA50 marine stereo system. Somewhat unusually, the steering wheel is offset slightly to the left, a feature Daniel Upperton of Stabicraft explains has come about from observing how people drive their centre consoles. When heading out through rougher water, most people work the throttle continuously to get the best ride. Offsetting the wheel creates a more comfortable driving position, with left hand on the wheel and right hand on the throttle. Hanging off the back of both boats is the very latest four-cylinder Yamaha F70 four-stroke outboard motor, and these are managed through the Yamaha Command Link digital gauges. These digital units provide detailed information about the motor through fully configurable displays. Somewhat unusually for a boat this size, there is also a Maxwell RC6 anchor winch fitted in the bow, eliminating back strain while retrieving the anchor. Helm seating in this boat is provided by a padded 72lt Icey-Tek chillybin, which neatly slides into the console unit. This provides a comfortable seat when required but also is completely out of the way in conditions where standing is preferable. Despite its width, the console allows plenty of space either side, allowing almost the whole length of the boat to be actively fished. In the stern are two fold-down seats, which double as a step over the transom since there is no step-through. On the outside, a step in the transom provides sitting or standing space while hiding the tote tanks on the inside. A rugged ‘T’ ladder provides a boarding facility. Heading out on the water, we were impressed by how dry and smooth the ride was on the Stabicraft 1600 Carbon. 16ft centre console boats are often wet due to the limited protection from spray, but the pontoons provide an extra-wide chine to keep spray away. The wing-style coamings also catch any water that creeps up the side of the hull, similarly turning that away from the occupants. This hull is also very rigid, making a quiet boat for a ‘tinny’. We opened the throttle up, and the holeshot ability of the new 70hp Yamaha was clearly evident. These motors are quick-revving which translates into great acceleration and top speed, and we easily reached 30kts. The strakeless hull was comfortable, and we had no issues cutting smoothly through the wake rather than pounding over them, although this made for less dramatic photos. The stability of Stabicraft hulls is legendary, and there will be no issues with a couple of fisherman working the same side of the boat. This boat is easy to manage single-handedly, although being rated for up to five occupants it would simply be selfish not to take a mate or two along for the trip! The Fisher range is Stabicraft’s cuddy cabin configuration, and the 1600 Fisher is one stunning looking boat. The sharp design of the Arrow pontoons, combined with the carbon fibre side panel and new stealth-fighter style rocket launcher drew positive comments everywhere we took it. But it is no show-pony, being extremely capable of handling the rough stuff. The hull is shared with the Frontier, right up to the gunwale. However the entire cabin module is made of resin-infused composite with carbon fibre panels and reinforcing. The dashboard, with its big tinted windscreen, looks like a supercar with a superb carbon fibre finish and digital gauges. We were particularly impressed by the attention to detail, especially the junctions between the hull and the composite superstructure. A combination of bolts and sealant is used to ensure a tight fit, and the workmanship is faultless, with the edges between the exposed carbon fibre and the painted alloy or composite all precise and solid. In this size boat the cabin serves merely as a storage area for gear as well as providing a windbreak for the helm seats. A tube mat protects the entire cockpit floor, and the bright paint job extends all the way up into the cabin. The helm seats are luxurious fully-upholstered pedestal models with folding backrests. The 1600 Fisher’s wider dash allows more space for the same electronics package as the 1600 Frontier, and the Furuno chartplotter-fishfinder is mounted centrally rather than in front of the helm position. The futuristic-looking rocket launcher, a blend of composite and alloy, is high enough not to worry six-foot-plus occupants and provides a convenient hand-hold for any standing passengers. The rear half of the boat is exactly the same as the Frontier, although during the review we fitted the baitboard into the transom. We tested the Game Chaser Transom by backing up a couple of times, and found the boat handles predictably and safely when reversing. This is a safety feature not only when fishing but also when manoeuvring around a marina or positioning the boat to drive onto the trailer. Although the Stabicraft 1600 Fisher is slightly heavier than the Frontier we still hit well over 30kts thanks to the amazing new Yamaha. The boat handles well, with tight turns being predictable and comfortable. The cabin and windscreen offer good shelter from the wind, and when seated there is hardly enough wind coming over the windscreen to ruffle the hair. 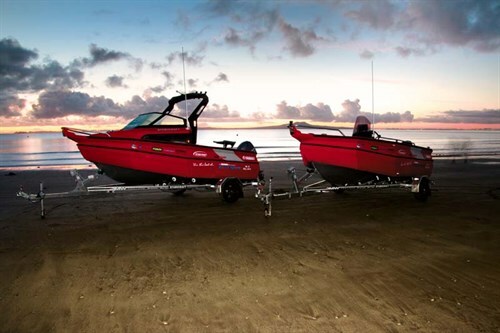 The boats both come on a custom single-axle trailer from DMW, and are a pleasure to tow. The only hazard we encountered was from curious passers-by, who kept stopping to look at the boat. MATERIAL Aluminum hull with resin infused composite console and carbon fibre strengthening. See the full version of this review in Trade-A-Boat #252, April / May 2015. Why not subscribe today?